Abbi Hawk and Thomas Muccioli in Lost Voices. Photo by Laura Rohrman. BOTTOM LINE: Eagle Project’s pair of one-act-plays explores the aftermath of Hurricane Katrina and continuing climate change, as well as the beauty of human connections in difficult times. When faced with extraordinary obstacles, the best of humanity shines through. Eagle Project's Lost Voices consists of two one-acts, each weaving a story of invisible connections between strangers, as well as different generations, in spite of time, distance, or difference. In Wide Blossoms by Elise Marenson, a young African American woman stumbles into a bar, demanding acknowledgement from a seemingly white lawyer. It is gradually revealed that the woman, Mari, played by Kayla Jackson with breathtaking sincerity, is a survivor of Hurricane Katrina. Devastated and confused, she seeks out help while searching for lost connections, guided only by her grandfather’s poetry. Ryan “Little Eagle” Pierce, founder of the Eagle Project, portrays the lawyer, James Landry. Despite his Caucasian look, Pierce is as a matter of fact Nanticoke Lenni-Lenape. His presence alone is the proof of the play’s thesis statement, that we are more connected to one another than we could ever imagine. The play also depicts the tender bond formed between apparent strangers and reminds one the power of compassion. Vanishing Point, by Lakota playwright Larissa Fasthorse, is a poetic tale of love and endurance. Rather than unfolding with a plot, the play weaves a gorgeous thread through time. 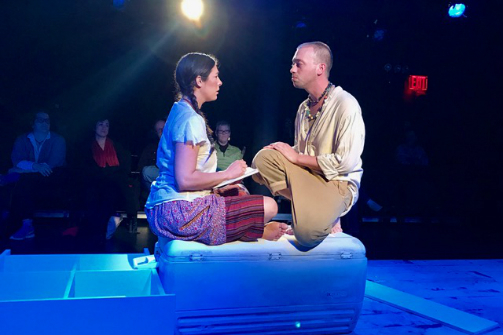 Director Jessi D. Hill’s staging of the scenes between actors Abbi Hawk and Thomas Muccioli (a member of the Cherokee nation), playing cousins, is stunning and heartbreaking. The representational nature of the two characters is translated onto stage in what is almost a choreographed dance. The piece's transitions are sharp, while the scenes seem lyrical and fluid. Three different tribes who are currently losing their land inspire the creation of these characters. Those tribes are "America’s first official climate refugees." In the play, we track the frustration, fear, nostalgia, and hope of the two cousins, who ultimately realize their responsibility to become a time capsule for future generations. Donna Couteau (Sac & Fox nation) plays the cousins’ grandma, as well as an old woman living many years in the future. The cyclical relationship between the characters fits perfectly the style of Native American storytelling. In their very simple yet effective ways, both plays show the beauty of quiet resilience and the strength of human bonds. To deny the connections between various, seemingly different groups of people leads to hatred and pain. To recognize it, which the playwrights and the director of Lost Voices have made easier, brings strength to people who are willing to stand together even in the most difficult of times. Lost Voices is by Elise Marenson and Larissa Fasthorse. Directed by Jessi D. Hill. Set Design is by Edward T. Norris. Lighting Design is by Miriam Nilofa Crowe. Costume Design is by Izzy Fields. Sound Design is by Emma Wilk. Production Manager is Rachel Alt. Stage Manager is Alex Haney. The cast was Donna Couteau, Abbi Hawk, Kayla Jackson, Kyle Leibovitch, Thomas Muccioli, and Ryan Victor Pierce.